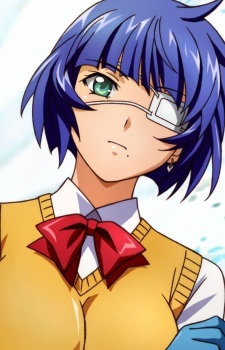 An odd girl with short blue hair and green eyes, a distinctive mole on her left cheek and a very strange history, mainly tied to her mysterious left-eye patch. Powerful and a B-rank, she is one of the Four Devas of Nanyo. She has a habit of wearing a blue miniskirted French maid outfit and specialises in professional wrestling moves, throws, and joint attacks, which she uses in conjunction with a pair of handcuffs she carries; she is also very proficient in making chi blasts. Her earlier life before she became a Toushi is unknown but is hinted as being tragic and painful. She, Teifu, and Saji have been best friends long before the start of the series. Ryomou is in love with Saji and cares for Teifu (who loves her). Ryomou has always fought for the fun of it and considers herself no one's woman. Presumably because of her dragon she has a minor split personality; one is fairly shy and normal and the other is psychosexual. Her psycho side is not nearly as bad as Ryubi, Sousou and Hakufu. Three years prior to the start of the series Ryomou fought Ryubi when her dragon had awakened and saved her life right before Ryubi attempted to rip her own heart out. In the process Ryubi's dragon possessed Ryomou's left-eye and now perfectly coexists with her. Its power even healed her completely after being mortally wounded and stabbed through the heart by Teni. No other characters seem to be in harmony with their dragons as much as Ryomou, but she still seals it with her eye-patch and is believed to be dying because of it. Very few are aware of this, and it is not stated whether she shares Ryubi's dragon or now has her own. While she has it, she is as powerful as the other Three Rulers. Her magical eye may be a reference to the Chinese idiom "To look at a person with a new eye" or reevaluate them or not to judge them by their appearance, an idiom attributed to Lu Meng who was as brilliant a scholar as he was a warrior. Ryomou's anime incarnation is much more taciturn and serious than her manga self to the point of being almost unemotional. She is not shy or spoony and acts uninterested in relationships. In one scene she isn't even phased when Saji puts his hand down her shirt and gropes her. Her magatama is also shown as being silver in the first season, and by the second season she is arguably as strong as Myousai, though she retreats during their first battle in order to protect the Dragon Jade. She doesn't have a past relationship to Seito and Ryubi either. Instead her dragon appears to be her own, though how she got it is not known. She also appears to be closer to Hakufu than she does in the manga and goes out of her way to help the Nanyo leader whenever she can. She even went out on her own to find the Dragon Jade to save Hakufu. She was badly injured after being ambushed by Teni. Chou-un came to her rescue but Ryomou awakened her own dragon, defeating Teni. Chou-un was able to knock out Ryomou, bandage her and return her to Nanyo after stealing the Dragon Jade. Chou-un stated that if Ryomou was not injured during the awakening of her dragon, Ryomou would have been able to defeat her. Ryomou recovered to full strength and played a part in the Battle of Chibi, defeating Myosai. She is now working along with Hakufu in a cosplay cafe, dressed as a cat maid (Ryomou even wears a heart-shaped eye-patch).